It’s always heartening when companies put down their corporate schtick to play nice with each other. Whether it is major game studios celebrating with competitors during flagship launches or the typical PR banter, it’s always a nice feel-good story for the press. Yet, in an odd turn, Epic Vice President (i.e. Fortnite) deleted his congratulations to the CEO of Respawn Entertainment over the tremendous launch of Apex Legends. But… why? 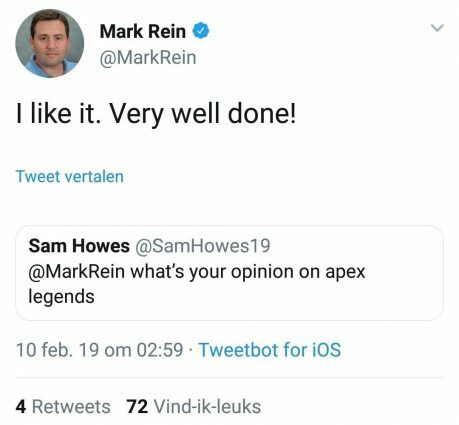 However, in writing this feel-good story, something is missing — that original Tweet from Rein saying how he liked Apex Legends. Why? Perhaps the optimists out there think that since he got a reply from Respawn, the message had been conveyed. 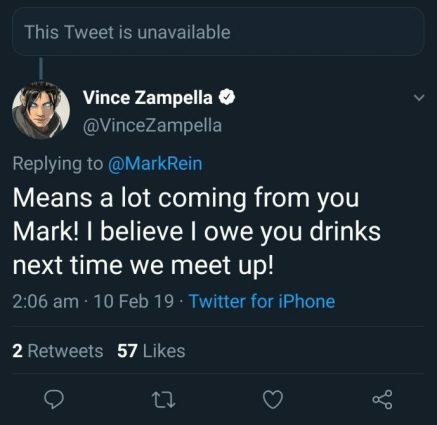 Without a doubt Zampella is sharing the Tweet with members of his team, as it is always a great thing to be appreciated and validated in the industry. On the other end, there is the likely chance that this was Epic Games doing some non-existant PR damage control. By all means, I’m sure they are increasingly conscious of the rise of Apex Legends — EA has been able to quote daily successes since the game’s unexpected launch. In the first eight hours, the battle royale title had scored over a million individual players. Within 48 hours, that number had jumped to 2.5 million players. Then, by the end of the work week, Apex Legends had managed to reach 10 million players, with a high score of 1 million concurrents. Heck, even doing a quick audit of both titles’ standings on Twitch, Apex Legends leads in viewership with 433K viewers. Fortnite is sitting in third, with just over 143K viewers. Whether this is a flash in the pan for the new battle royale game or the white whale to finally surpass Fortnite, those are some terrific numbers for the once under-appreciated EA team. And as I mentioned earlier, congratulating competitors is commonplace in the industry. Lest we not forget how Phil Spencer (Executive Vice President of Gaming at Microsoft) reached out to Sony and Santa Monica Studios over God of Wars’ stellar reviews. Or when the Microsoft brand congratulated Nintendo for the launch of the Nintendo Switch. We can’t tell for certain why the Tweet was deleted, whether it was a mistake from an intern or a call from the Epic Games PR team to tear down some goodwill across the industry. But the optics make it look like Fortnite feels like it is on the ropes, which is clearly the opposite of what they want to convey in this critical time. Apex Legends is available now on PC, PS4, and Xbox One as a free-to-play battle royale game. Meanwhile, Fortnite can be found on any platform you may have — be it mobile, console, or PC.